The DM250 amplifier is the result of several years of work by the STRUSS AUDIO team. In its construction, more than thirty years of experience and knowledge of the creator and owner of Struss Amplifiers Zdzisław Hrynkiewicz-Struss were used. After many years of trials and improvements, a design was developed whose spatial layout of individual electronic and mechanical elements allowed to obtain the shortest possible connections between elements, high resistance to interference with an excellent cooling system and thermal stability. An interesting design of the amplifier housing has also been developed. The construction that was the basis of the DM250 project was created in 2000, and with the changes resulting from the introduction of new technical solutions and changes in production technology, it was used in the latest model of the Struss Audio amplifier. One of the unique design solutions used in DM250 is the HPCS (Harmonics and Phase Conversion System). This solution, developed by Struss Audio, allows to obtain an extremely vivid and colorful sound, whose values have been very highly rated by specialists from the professional sound and sound system industry, as well as lovers of high quality audio systems. The HPCS system is a solution that, while maintaining extremely high technical parameters of the amplifier’s path, allows to obtain a sound that is pleasant to the human ear. The characteristic sound of the DM 250 amplifier is obtained through tube constructions. The sound of the DM250 is determined by the unique design of the amplifier, based on the principle of minimizing the number of active electronic components and precise selection of their operating conditions. This, amongst other factors, determines the extremely high parameters of the amplifier, such as the frequency response from 5 Hz to 250 kHz, very low noise level and negligible level of distortion of non-linear power levels. As well as the excellent electronic parameters, the DM250 amplifier is characterised by a warm and friendly sound, whilst maintaining the detail and selectivity. Thanks to this, it is also possible to obtain the effect of a “holographic sound field” that goes far beyond the classical effects of stereophony. As usual in the case of listening to music through electronic systems, the quality of the sound source, loudspeakers and appropriate cables connecting individual components of the audio track are also important. Interesting are the results of comparative listening, various sources and connection cables. The DM250 amplifier allows you to hear the differences in the quality of these components with great precision. It is worth referring to the well-known features of amplifiers based on semiconductor components. It has been known for a long time, that transistors based on transistor technology generate odd harmonic distortions, which cause the sound to gain the so-called transistor tone, characterized by a certain sharpness and hardness. Such sounds dominate especially in amplifiers built on bipolar transistors. In addition, loop negative feedback. It is also the cause of additional TIM (Transient Intermodulation Distortion) distortions, also responsible for the “transistor” sound. In the field of measured technical parameters, such amplifiers obtained excellent results both in terms of a low level of harmonic distortion, so-called THD (Total Harmonic Distortion), intermodulation distortion, wide frequency response, low noise and output power or signal rise rate. These parameters have a pure marketing significance, but often we are not informed of the real sound quality of the equipment. It is worth remembering that nonlinear distortions for high quality equipment are kept at the level of fractional percentages, even for very high acoustic signal strength. If the non-linear distortion of the amplifier is close to zero, one can get the impression that it is a very high quality piece of equipment, but unfortunately it is often characterised by a dry, metallic sound, which sounds artificial and unnatural. As shown by psychoacoustic research and the experience of lovers of audio equipment, pleasant and high quality sound depends on the ratio between even and odd harmonic frequencies in the spectrum of arising distortions present in the amplified signal. The odd harmonics of a high order are particularly unpleasant to the human ear. Due to the logarithmic character of auditory sensitivity, it is possible to hear components of sound of intensity, constituting a fraction of a percent of the main sound signal. It is this feature that is responsible for hearing timbre. The reason why even harmonic distortions are easily felt by human hearing is obvious from the world of music – this is a subjective feeling of consonance and dissonance. In general, according to Helmholtz’s classification, absolute consonance is considered to be the coexistence of two sounds, with frequencies in the ratio 1: 1, 2: 1, which on the one hand corresponds to the musical interval of the primary, that is the fundamental frequency and octave or the first even harmonic. Consonance is perceived as pleasant and natural. It is the reception of music and the accompanying sounds that are the most important factors for those who appreciate good sound systems. It is necessary, therefore, to take into consideration the characteristics of listening and perception of music, rather than only focusing on the technical perfection of an electronic system when constructing amplifiers. What’s interesting, is that so-called ‘clean transistor tone’ where it is possible to remove distortions below the threshold of hearing, is considered to be subjectively perceived as too loud and detailed, exposing the failures of recording or errors of the sound engineer. This sometimes leads to a paradoxical situation when some recordings, especially historical recordings, cannot be heard on very high quality equipment. Tube amplifiers, highly-valued amongst many audiophiles, introduce harmonic distortions of an even row, thus providing a warmer and more realistic sound. Unfortunately, tube technology is troublesome due to the lower durability of lamps and their lack of availability, the use of transformers in the output stage, the need to use high voltage supply and problems in the reproduction of low frequency and high power acoustic signals. Furthermore, even high-quality tube amplifiers generate harmonic distortions at a high level. Despite all these inconveniences and problems, tube amplifiers have a loyal fan base. The conclusion is that human hearing in the perception of sound, reinforced by electroacoustic systems prefers ‘friendly, warm and rounded’ sounds. This effect is particularly noticeable through longer listening, especially at higher volumes. The audiophile world has been discussing the benefits of the transistor over the lamp, and vice versa for years. A specific compromise between tube and transistor designs is their hybrids. Many models of electroacoustic equipment from renowned world companies, both on the source and the amplifier side, have a tube stage that generates even harmonics and affects, to a certain extent, the signal dynamics. The subjective effect of such a solution results from the existence of the masking effect of sounds. Thanks to this, despite the presence of odd harmonics resulting from transistors operating in the acoustic track, the even harmonics generated in the lamp mask them, and make the whole system acquire a more ‘tubey’ sound. After years of experience and observation, the unique HPCS (Harmonics and Phase Conversion System) by Struss Audio was created. It is constructed on the basis of a transistor (J-FET) system, in which thanks to precisely selected technical elements, it was possible to obtain the effect of generating even harmonics, whilst reversing the phase of the signal. The end result is an increase in the amplified signal with a higher number of even harmonics in relation to odd ones. Consequently, the amplifier has a warm and appealing sound. The HPCS system is a solution that, introducing some subtle modifications in the spectrum and dynamics of the acoustic signal, adapts the sound of the DM250 amplifier to the subjective needs and characteristics of human hearing. This resembles to a certain extent, the effects obtained in tube amplifiers, but without the inconvenience of using lamps. In addition, the amplifier has the ability to precisely amplify the acoustic signal throughout the whole acoustic spectrum, with a perfectly sounding and dynamic low frequency range. Also, the enhancement of medium and high frequencies, with a negligible effect on phase shifts, allows the listener to hear the exact location of apparent sound sources and the effect of reproducing sound and depth plans of the sound image. As a result, the sound obtained is the perfect combination of the ‘tube tone’ and an energy-efficient linear transistor amplifier. Struss Audio Harmonics and the Phase Conversion System (HPCS) is a solution that enables the listener to move into the real world of music from the comfort of his own home. The amplifier is characterized by the closeness to the ‘tubey sound’ so favored amongst audiophiles, while maintaining all the best features of the transistor amplifier, such as speed and low frequency control. The amplifier’s design also contains a number of other elements which influence sound quality, as well as the aesthetics of the amplifier. The amplifier casing is made of photo-electrically dyed aluminum alloy. Thanks to the carefully made electrical connections in the shielding circuit connected to the housing, high resistance to external disturbances was obtained. In the power stage, two specially designed and made toroidal transformers with a power of 500 VA each were constructed from sheets with high magnetic permeability, produced by Thyssen. Transformers made of these sheets are characterised by low loss at high inductances, smaller dimensions and a very low level of the diffused magnetic field. The transformers are mounted on anti-vibration stands and secured with a special plastic epoxy mixture. Their mounting to the carrier plate of the amplifier (chassis) through a copper plate with a thickness of 3mm, additionally eliminates vibrations and strengthens the housing of the amplifier. The amplifier’s power supply is equipped with Nippon Chemi-Con electrolytic capacitors, with a total capacity of 60,000 uF. The output stage of the amplifier is based on MOSFET transistors. Power transistors are mounted on an aluminum plate, to almost completely eliminate vibrations caused by the presence of transformers, and effectively dissipate heat to the cooling system. The convection cooling system is precisely designed using a specially made heat sink. The power transistors are mounted directly under the printed circuit board, and the heat is transferred to the heat sink via a 15 mm aluminum plate, to which the power transistors are screwed. Such a system has allowed to reduce the size of the amplifier considerably. The front panel of the amplifier housing is made of aluminum alloy, which is curiously also used in the aviation industry. 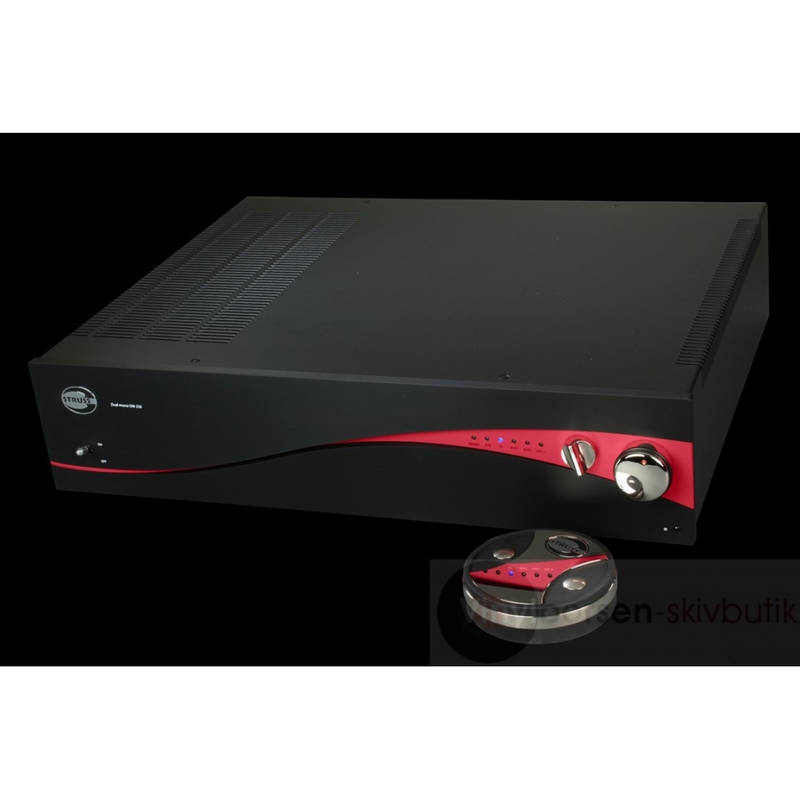 The amplifier is equipped with a modern system of delayed power supply (soft start) and an anti-reflection filter. This solution eliminates overvoltage when the amplifier is turned on, thus preventing damage to the electrolytic capacitors that filter the damping in the power supply circuit. The amplifier’s back plate is equipped with gold-plated loudspeaker terminals, dedicated RCA sockets from the renowned German company ‘WBT’ and XLP inputs use professional sockets from the brand ‘Amphenol’. The remaining RCA inputs are made of gold plated jacks produced by the Japanese company ‘Jalco’. The amplifier uses a C & K network switch (from the USA) with a blockade to prevent accidentally switching the device on or off. The input selector was made using a multi-position C & K switch. For adjusting the volume, a motorized ‘Blue Velvet’ potentiometer produced by ‘Alps’, characterised by very high precision and coherence, was used. Vinyl record fans have also not been forgotten. The amplifier has a phono input for the MM cartridge, and a RIAA correction preamplifier in which the Texas Instruments integrated circuit is used, based on the JFET structure. The RIAA curve was modified, adding an additional time constant of 3.2 uS (Neumann), thus obtaining a greater spatiality of the musical image. For XLR input, the differential input level was also used in JFET technology, which is STRUSS AUDIO’s very own solution. The design of power amplifiers is based on our own patent ‘Struss – RP No. 176514’. In the signal path, power amplifiers do not have any capacitive element (capacitor) and are constructed only using JFET transistors. This guarantees their sound neutrality – so sought after among high-end audio devices. In the amplifier’s power amplifier, two pairs were used, for each channel – American MOSFET transistors from International Rectifier. The power amplifiers do not have any dynamic distortions, which makes it possible for the DM250 to achieve a very high level of sound quality. The power amplifier is built as a dual mono circuit. The entire signal path was designed in such a way that the user could use two parts separately, i.e. from a preamplifier or power amplifier. The disconnection of these two components takes place by means of a switch placed on the front panel. In addition, there is the possibility to directly connect the power amplifiers to the acoustic signal source. The amplifier has a protection system against damage, e.g. in the event of a short-circuit in loudspeaker output and protection of loudspeakers in the event of a constant stream of voltage on its output. STRUSS AUDIO has not forgotten about eliminating the harmful effects of the remote control processor clock (8.86 MHz), which has been shielded and isolated from the mass of the acoustic track. The 0.370 kg remote control is made of an aluminum alloy. We offer you a device that, through its sophistication and parameters, should satisfy the most demanding of music lovers. The DM250 amplifier allows you to transport the listener to the real acoustic space of the music being listened to.